After the upgrade disaster of the "frimware" of a HM-10, I decided to retry with 2 new modules, this time from a european based reseller. And since I also supported the airboard project, I decided to buy them in XBee format (without really knowing it, see below). 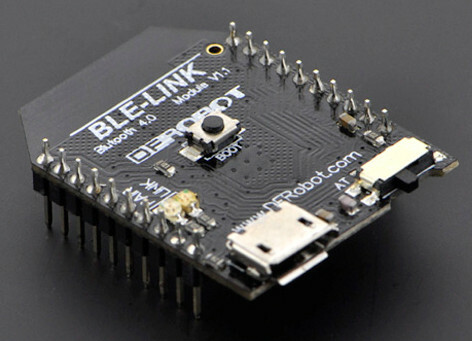 The first module is a Bluetooth BLE Link Bee from DFRobot. 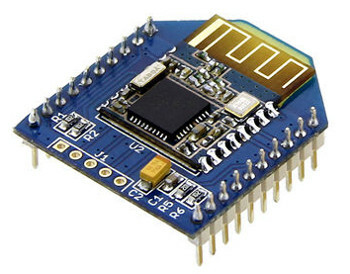 This module is the one officialy supported by the airboard. 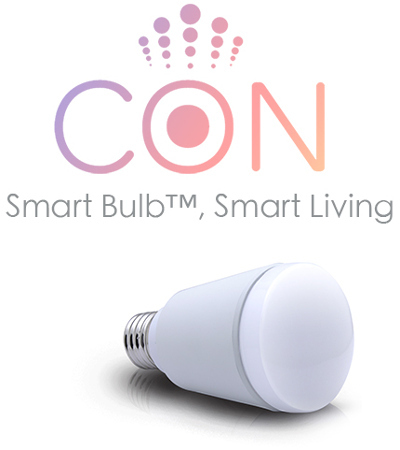 It comes with a very handy micro-usb port and integrated voltage regulator & leds. The "AT" physical switch is no longer in use with recent firmware. I haven't explored much but, so far, I am happily surprised. The second one is a BLE Bee - Based on HM-11 Module from Seeedstudio. This is basically a HM-11 module with a couple of capacitors in the XBee form factor. Nothing more! Not even a "system led". Price (even directly in China) is basically 4 times the one of the HM-11 alone and twice the one of the module above (but with fewer bells and whistles). This sounds odd but at least the embedded HM-11 seems genuine and the upgrade to the very latest firmware went without a hitch!! As a frenchman, I am a strong Metric System Advocate as it is better on all counts. But having a module using a 2mm (instead of standard 2.54mm) spacing was annoying (that said the HM-1x modules themselves use 1.5mm) as I had to create a makeshift pin adapter to be able to connect to the module. At least, I'll know for next time! Despite following all the instructions carefully, I was still unable to create a iBeacon with these modules. Turned out that there is a bug with iOS 7.1.1 and iBeacons are not always detected. So maybe that was the signal to upgrade to iOS 8. 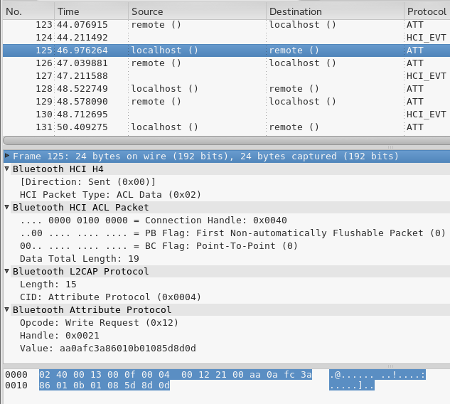 Bluetooth Low Energy : HM-.... dead! Following my adventures with the HM-12 unconventional module, I carried my experimentations with the HM-10 module this time. If the majority of the functions were working, some of them like the iBeacon related ones were giving me... nothing! I used the correct file ("CC2540" chip and HM-10 firmware) and the upload wasn't interrupted... So what went wrong? Not a clue... I only guess that I managed to brick my $6.87 module. This time I am really starting to wonder if these HM modules were really genuine! While I am still waiting to receive a few Bluetooth Low Energy (aka Bluetooth 4.x) tags bought on Kickstarter and Indiegogo Crowfunding platforms, I recently ordered a HM-10 and a HM-12 modules. This modules being tiny, I went for the HMSensor version of the HM-12 thinking it would be easier to use straightaway. Having this one to work turned into A Quest with a lot of wasted time... Since it is relatively badly documented, here is some information which, I hope, could be helpful to someone else. As always, it's a lot easier when one has the right documentation! Thanks to the 2 TX & RX pins, using the UART/Serial connection should be very easy. The standard 9600,N,8,1 doesn't give anything, nor speeds just above (19200 or 38400 bauds). Usually when the speed is not totally correct, there is at least some garbled characters. In this case... Nothing, nada. 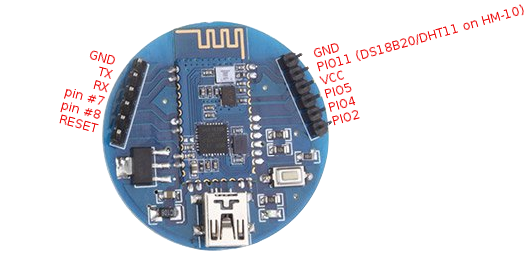 The iBeacon module from the same manufacturer mentions that AT commands can't be sent through the UART but have to be fed through a Bluetooth connection. Who knows, maybe this module was having the same behaviour? It is worth noting here that I own an iPad 4th generation and a relatively old Android 4.1 mobile (hence without BLE). The mobile being a no go with BLE, I tried a dozen of iOS apps to connect the iPad to the HM-12 module. The only one which seems usable for this purpose was Lightblue. Yet, if I could see the module and establish a connection (blue light goes from blinking to steady), I was then stuck with one obscure service UUID: FFE0 and basta! Still nothing interesting and moreover still unable to make anything of it. So, it was time to turn to the mobile which doesn't talk "New bluetooth" but is fluent in the "Old one": This time, I was able to see the HM-12 (by the way, it is by default advertised as "HMSoft" in both modes). After guessing the pin was "1234", connection was established promptly. Even a documentation from a certain Tinysine HM-12 wasn't helpful as I still wasn't able to access any of the AT commands. Both seems strictly identical otherwise and as I was about to give up, I searched for HM-13 instead of HM-12. A wiki page from Seeed-Studio gave me two clues as their "Grove - BLE (dual model) v1.0" breakout board was almost identical to my uncooperative sample! No wonder I could not communicate via the serial port... the set speed (115200 bauds) being way higher than the usual (and described in other datasheets) ones (i.e. 9600 bauds). While unconnected, the HM modules do not send any data on the serial port unless replying to a command (no greetings whatsoever). This behaviour can be modified but it explains why no data could be observed over the serial port. Any unrecognised AT command won't produce any output (not even an error). Commands have be be sent in one go, typing "A" then "T" won't work. The easiest way I found to overcome this is to prepare the command in a separate text editor then to send it (for example using minicom) via copy and paste. Actually the datasheet for these module can be found on the manufacturer's website but is NOT search engine friendly as it is hidden in a zip file called "Bluetooth Dual". The second useful thing on the Seeed-Studio wiki page is the way to use the lightblue App as a pseudo terminal emulator. Very handy! 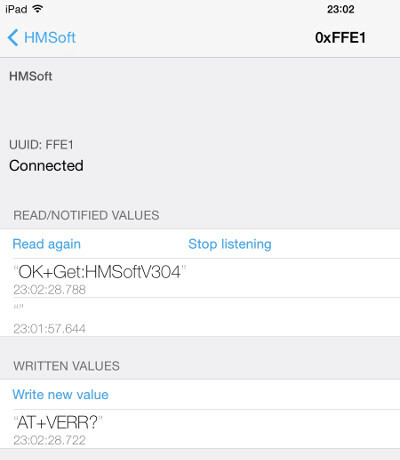 The HM-10 firmware seems to come in 2 flavours: HMSoft and HMSensor. No trace of a HMSensor with HM-12 on the manufacturer site so I really wonder what is going on. Moreover, it doesn't really make sense to have a Old fashion bluetooth powered by a tiny lithium battery which would not last longer than a day! I removed the HM-12 module (and damaged it in the process) and the HMSensor board bear the mention " HM-10". Fake? Assembly mistake? No idea. In the meantime, I soldered the HM-10 and playing with it right now!